Hallelujah! 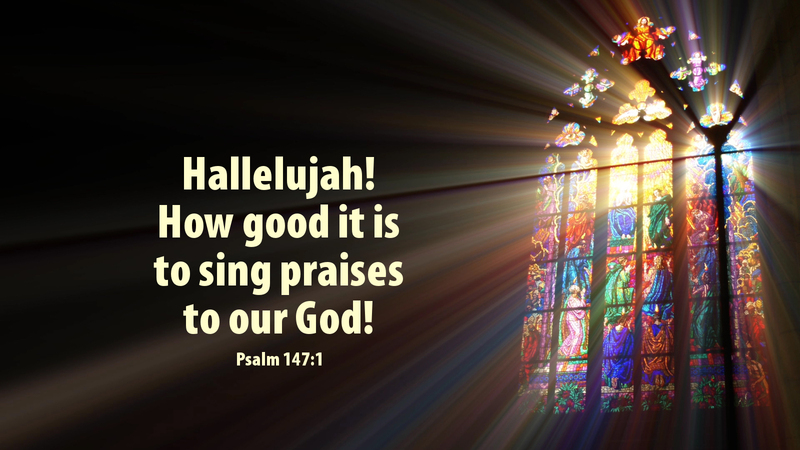 How good it is to sing praises to our God! The Lord rebuilds Jerusalem; he gathers the exiles of Israel. Having just spoken about the need to read all the psalms to hear Law and Gospel, we now have a psalm that is full of good news, praise and thanksgiving! Read the entire psalm, if you can make time today. It begins with praise, but praise because of the wonderful deeds the Lord God has done for his people. The Lord rebuilds, gathers, heals, binds up, lifts up, casts down, gives clouds and rain, grass and plants “to serve mankind.” He has protected his people, blesses our children, establishes peace, satisfies us with finest wheat. All of this he does because he is our God, and mighty in power, limitless in wisdom. Yet, for all this and even more, God declares his Word to us! Given first to Jacob/Israel, God has now given us his Word, Jesus, the Word made flesh to dwell among us full of grace and truth! We have been given the “means of grace,” Word and Sacrament, the focus of our worship and the center of our lives, as we “feast” on Jesus present with us as the incarnate Word! The old saying goes, “How odd of God to choose the Jews.” We might say, “how odd of God to choose you — and me!” Together, we are unworthy and undeserving, yet God has given us his Son, as a gift — the greatest Christmas gift of all! Mary’s song sounds very much like our psalm for today, full of praise and thanksgiving and worship! We have God’s Word — Jesus Christ! We have the Holy Scriptures and the manger in which the Christ is laid! Hallelujah! Glory to God! Prayer: Lord God, may our lives be full of praise and thanksgiving, as we receive the Word made flesh, Jesus Christ. Amen. Advent Action: Read all of Psalm 147 and Luke 1 today.